STOP THAT ANNOYING TOP END TAPPING! For all Twin Cams, and EVO Big Twins and Sporsters! 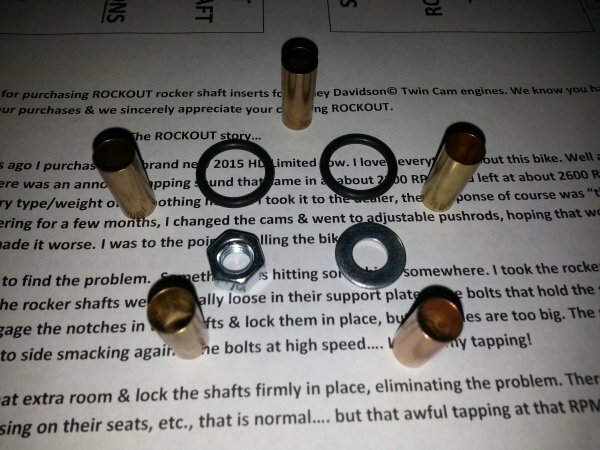 Months of research lead me to the cause of the noise, now there's a solution.... ROCKOUT rocker shaft locks. Seven months ago I purchased my brand new 2015 HD Limited Low. I loved everything about this bike. Well almost everything. There was an annoying tapping sound that came in at about 2300 RPMs and left at about 2600 RPMs. I tried everything, every type/weight of oil, nothing helped. I took it to the dealer, their response was “they all do that”, and they were right. After suffering for a few months, I changed the cams & went to adjustable pushrods, hoping that would fix it. If anything it just made it worse. I was to the point of selling the bike. I was determined to find the problem. Something was hitting something, somewhere. 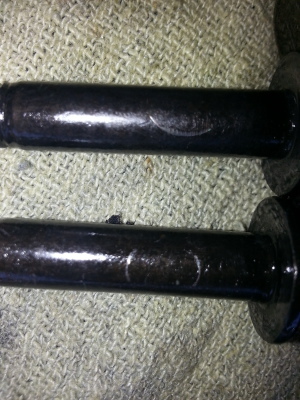 I took the rocker assembly all apart, & I noticed the rocker shafts were actually loose in their support plates. The bolts that hold the support plates down are supposed to engage the notches in the shafts & lock them in place, but the holes are too big. The shafts rock back & forth, and slide side to side smacking against the bolts at high speed…. I found my tapping! The inserts take up that extra room & lock the shafts firmly in place, eliminating the problem. Easily installed with common hand tools, ROCKOUTS will put that smile back on your face when you ride! And here is the cause....FINALLY! Stop the aggravation, order your ROCKOUTS today! All ROCKOUT kits come with a spare insert!